Sign up for free with us today to unlock advanced search tools. You can also save your favorite homes that you've already viewed! Kalaheo, located in southern Kauai, is home to many beautiful Hawaiian plantation homes with completely renovated interiors. Kalaheo real estate comprises unique architecturally designed homes and beautiful acreages. The town's culture and exquisite properties are perfect for buyers interested in an authentic Hawaiian lifestyle, just minutes away from the South Shore's beautiful beaches. Kalaheo homes for sale are located in the southern part of Kauai just 20 minutes east of Lihue. 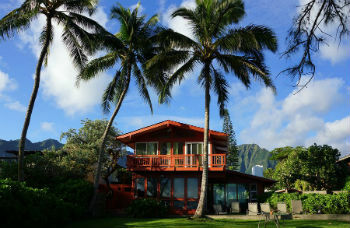 Here you'll find many beautiful Hawaiian plantation homes with completely renovated interiors. Kalaheo real estate is comprised of unique architecturally designed homes and beautiful acreages. The town's culture and exquisite properties are perfect for buyers interested in an authentic Hawaiian lifestyle, just minutes away from the South Shore's beautiful beaches. Whether you are looking for a luxurious home on the golf course or an affordable home nestled amongst the trees, you'll have lots to choose from in the fabulous town of Kalaheo. Some of the Kalaheo real estate has been recently renovated but have managed to keep with their historic theme to try and preserve the Hawaiian culture. The properties in this city are surrounded by a lush tropical oasis. With room for a greenhouse, buyers can embrace Hawaiian vegetation and grow their own Hibiscus and orchid gardens. As well, only a short distance to the amazing beaches in Koloa and Poipu, any buyer will feel fortunate to call a Kalaheo property their home. One interesting feature of the Kalaheo neighborhood is the Kukuiolono Park & Golf Course. This park has a newly renovated Japanese garden that offers visitors a wonderful place to stroll along the walking paths and enjoy the astounding natural space. There are other pathways for hikers or runners to use in this park, which lead to some spectacular viewpoints where you may be able to see whales swimming in the ocean in the distance. If you are an avid golfer, then you'll be elated to be able to golf in this remarkable natural setting. Kalaheo is also the official headquarters for the National Tropical Botanical Gardens. These hard at work botanists ensure that endangered plants species are protected from extinction. They study and preserve these plants and share their findings with the world. There are tours of the facility, public lectures, and volunteer opportunities to get you involved in these wonderful addition to the Kalaheo Neighborhood. With so many fun things to do and the beautiful nearby beaches, residents will never be bored. Whether you take the kids to Spouting Horn Park to watch the blowhole water feature, or swim in the ocean down at Poipu Beach Park, you'll have many beachfront areas to visit on a daily basis. With gorgeous Kalaheo real estate, stunning mountain views, and lots of amenities to make residents happy, you'll be overjoyed that you get to call Kalaheo home. Interested in learning more about Kalaheo real estate? Get in touch with Kauai's real estate professional, Anne Eliason, today!